The space agencies of the USSR (now Russia and Ukraine), the United States, the European Union, Japan, China,India, and Israel have collectively launched probes to several planets and moons of the Solar System, as well as to a number of asteroids and comets. Approximately 15 missions are currently operational. Once a probe has left the vicinity of Earth, its trajectory will likely take it along an orbit around the Sun similar to the Earth's orbit. To reach another planet, the simplest practical method is a Hohmann transfer orbit. More complex techniques, such as gravitational slingshots, can be more fuel-efficient, though they may require the probe to spend more time in transit. Some high Delta-V missions (such as those with high inclination changes) can only be performed, within the limits of modern propulsion, using gravitational slingshots. A technique using very little propulsion, but requiring a considerable amount of time, is to follow a trajectory on the Interplanetary Transport Network. The Lunokhod 1 unmanned rover on the surface of Moon, displayed in Memorial Museum of Cosmonautics. The Curiosity rover on the surface of Mars. The Rosetta orbiter and Philae lander nearing comet 67P. Voyager 2 in interplanetary space. Artist's concept of Deep Impact prior to its planned collision with comet Tempel 1. First man-made object to soft land on the Moon, or any other extra terrestrial surface. First mission to photograph the far side of the Moon, launched in 1959. First robotic sample return probe from the Moon. First rover on Moon. It was sent to the Moon on November 10, 1970. First successful in-place analysis of another planet. It may have also been the first space probe to impact the surface of another planet, although it is unclear whether it reached Venus' surface. The Venera 7 probe was the first spacecraft to successfully soft land on another planet (Venus) and to transmit data from there back to Earth. Upon its arrival at Mars on November 13, 1971, Mariner 9 became the first space probe to maintain orbit around another planet. First soft landing on Mars (December 2, 1971) The lander began transmitting to the Mars 3 orbiter 90 seconds after landing. After 20 seconds, transmission stopped for unknown reasons. First successful rover on Mars. The first dedicated missions to a comet; in this case, to Halley's Comet during its 1985–86 journey through the inner Solar System. It was also the first massive international coordination of space probes on an interplanetary mission, with probes specifically launched by the Soviet (now Russian) Space Agency, European Space Agency, and Japan's ISAS (now integrated with NASDA to JAXA). Originally a solar observatory in the International Sun-Earth Explorer series, it was sent into solar orbit to make the first close observations of a comet, Comet Giacobini–Zinner, in 1985 as a prelude to studies of Halley's Comet. Two Russian/French spacecraft. They dropped landers and balloons (first weather balloons deployed on another planet) at Venus before their rendezvous with Halley's Comet. This Japanese probe was the first non-US, non-Soviet interplanetary probe. The first space probe to penetrate a comet's coma and take close-up images of its nucleus. First solar wind sample return probe from sun-earth L1. First sample return probe from a comet tail. First probe to land on an asteroid. First sample return probe to launch from an asteroid. The Rosetta space probe flew by two asteroids and made a rendezvous and orbited comet 67P/Churyumov-Gerasimenko in November 2014. First probe to Jupiter. Radio communications were lost with Pioneer 10 on January 23, 2003, because of the loss of electric power for its radio transmitter, with the probe at a distance of 12 billion kilometers (80 AU) from Earth. Voyager 1's view of Solar System (artist's impression). Voyager 1 is a 733-kilogram probe launched September 5, 1977. It visited Jupiter and Saturn and was the first probe to provide detailed images of the moons of these planets. 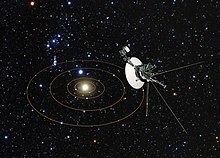 Voyager 1 is the farthest human-made object from Earth, traveling away from both the Earth and the Sun at a relatively faster speed than any other probe. As of September 12, 2013, Voyager 1 is about 12 billion miles (19 billion kilometers) from the Sun. On August 25, 2012, Voyager 1 became the first human made object to enter interstellar space. Voyager 1 has not had a functioning plasma sensor since 1980, but a solar flare in 2012 allowed scientists from NASA to measure vibrations of the plasma surrounding the craft. The vibrations allowed scientists to measure the plasma to be much denser than measurements taken in the far layers of our heliosphere, thus concluding the craft had broken beyond the heliopause. Voyager 2 was launched by NASA on August 20, 1977. The probe's primary mission was to visit the ice giants, Uranus and Neptune, which it completed on October 2, 1989. It is currently the only probe to have visited the ice giants. It is the fourth of five spacecraft to have left the solar system. It has been operational for 41 years and 2 months as of October 20, 2018. Cassini–Huygens was a 5,712kg (12,593lb) space probe designed to study gas giant Saturn, along with its ringed system and moons. The NASA probe was launched with ESA lander Huygens on October 1, 1997 from Cape Canaveral. The Cassini probe entered Saturn orbit on July 1, 2004, and Huygens landed on Titan, Saturn's largest moon, on January 14, 2005. On September 15, 2017, the probe was de-orbited and burned up in Saturn's atmosphere, after almost 20 years in space. First probe to be launched to Pluto. Launched on January 19, 2006, it flew by the Pluto–Charon system on July 14, 2015. First spacecraft to visit and orbit a protoplanet (4 Vesta), entering orbit on July 16, 2011. Entered orbit around dwarf planet Ceres in early 2015. Currently orbiting Ceres as of February 2017. First probe to Jupiter without atomic batteries, launched August 8, 2011. Chang'e 2 was deployed to orbit the Moon, visit Sun–Earth L2 Lagrangian point, and make a flyby of asteroid 4179 Toutatis. Along with Pioneer 10, Pioneer 11, and its sister space probe Voyager 2, Voyager 1 is now an interstellar probe. Voyager 1 and 2 have both achieved solar escape velocity, meaning that their trajectories will not return them to the Solar System. Examples of space probe imaging telescope/cameras (focused on visible spectrum). Image forming systems on space probes typically have a multitude of specifications, but aperture can be useful because it constrains the best diffraction limit and light gathering area. Artist's concept of New Horizons approaching Pluto. Artist's concept of New Horizons near Pluto. ^ "Space Probes". National Geographic Education. National Geographic Society. ^ "Planetary Exploration Timelines: A Look Ahead to 2016". The Planetary Society. ^ "NASA – NSSDCA – Spacecraft – Details". ^ September 30 – October 05, 2010 Spirit Remains Silent at Troy NASA. 2010-10-05. ^ Webster, Guy (25 May 2011). "NASA's Spirit Rover Completes Mission on Mars". NASA. Retrieved 2011-10-12. ^ "NASA Concludes Attempts to Contact Mars Rover Spirit". NASA. Retrieved 25 May 2011. ^ Chang, Kenneth (May 24, 2011). "NASA to Abandon Mars Spirit Rover". New York Times. ^ NASA Mars Rover Arrives at New Site on Martian Surface Jet Propulsion Laboratory, 10 August 2011. ^ Brown, Dwayne; Wendel, JoAnna. "NASA's Record-Setting Opportunity Rover Mission on Mars Comes to End". NASA. Retrieved 10 April 2019. ^ "Genesis – Search for Origins". Jet Propulsion Laboratory. Retrieved July 13, 2016. ^ ""Where Comets Emit Dust: Scientists Identify the Active Regions on the Surface of Comets" – ScienceDaily (Apr. 29, 2010)". sciencedaily.com. ^ "Voyager 1's view of Solar System (artist's impression)". www.spacetelescope.org. Retrieved 12 January 2017. ^ "NASA Voyager 1 Encounters New Region in Deep Space". NASA. ^ JPL.NASA.GOV. "Voyager – The Interstellar Mission". nasa.gov. ^ "NASA Spacecraft Embarks on Historic Journey Into Interstellar Space". NASA. ^ "Huygens Probe Separation and Coast Phase". ^ Brown, Dwayne; Buckley, Michael; Stothoff, Maria (15 January 2015). "January 15, 2015 Release 15-011 – NASA's New Horizons Spacecraft Begins First Stages of Pluto Encounter". NASA. Retrieved 15 January 2015. ^ "NASA's Dawn Spacecraft Hits Snag on Trip to 2 Asteroids". Space.com. August 15, 2012. Retrieved August 27, 2012. ^ "Dawn Gets Extra Time to Explore Vesta". NASA. April 18, 2012. Retrieved April 24, 2012. ^ "NASA's Juno Mission to Jupiter to Be Farthest Solar-Powered Trip". Retrieved October 2, 2015. ^ "Voyager-The Interstellar Mission: Fast Facts". Jet Propulsion Laboratory. Retrieved November 2, 2013. ^ "Voyager-The Interstellar Mission". Jet Propulsion Laboratory. Retrieved November 2, 2013. ^ "Mars Global Surveyor". Archived from the original on 2012-02-19. ^ "eoportal – LRO (Lunar Reconnaissance Orbiter) – LROC". Archived from the original on 2012-03-16. ^ a b "Cassini Solstice Mission: ISS". Cassini Solstice Mission. Archived from the original on 2015-01-14. ^ "Basics of Space Flight Section II. Space Flight Projects". nasa.gov. ^ a b "Voyager". astronautix.com. ^ "NASA – NSSDCA – Experiment – Details". ^ "Deep Space 1". nasa.gov. ^ "NASA PDS – MDIS". Archived from the original on 2010-06-02. ^ "Sierks, et al. – The Dawn Framing Camera: A Telescope En Route to the Asteroid Belt – MPS/DLR/IDA".